Social-Engineer.Org CTF Update – Awareness Abounds The Heat is On! DEF CON 18 Artwork Contest Winners! DEF CON 18 Speaking Schedule is Live! The DC 18 Speaker List is Still Growing! That's Right. More Talks Posted. And The Talks Keep Coming! CFP Closes, More Talks Posted! Reg Open For SE Contest! Contest & CFP Action Required! More DEF CON 18 Speakers! DEF CON 18 Speakers Posted! EFF Proudly Presents the First Annual Defcon Getaway Fundraising Contest! DEF CON 18 Event/Contest Update! DEF CON 18 CTF Quals Announced! DEF CON 18 Archive Page is Live! The DEF CON 18 Archive Page is up and running! Currently, we have all of the presentation slides, white papers and extras posted, as well as the DEF CON 18 Program in pdf format! Coming in the next week or so we'll have contest results, press, and even a few early release videos! So check it out and begin reliving the glory that was DEF CON 18! DEF CON 18 was a resounding success! With more contests, events, attendance and talks, this year's show was a fitting end to our years at the Riviera! We'd like to thank the Riv for working with and hosting us for 5 awesome years! We'd also like to thank all the folks who sacrificed time, effort, and resources to contribute to the hacking community, as well as a huge thank you to all the attendees for showing up and learning, growing and participating in all this con has to offer! We've all had a chance to wind down decompress from all the excitement of DEF CON 18, and all of the results, press, photos, updated materials and other content is rolling in. Starting in the next couple of days and through the next few weeks, we'll be posting all of this info for everyone to enjoy, reflect upon, and learn from. 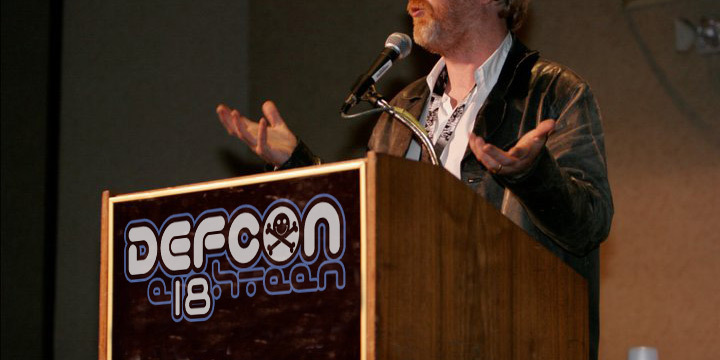 Keep your eyes on defcon.org, the DEF CON RSS feed, our Twitter and Facebook for all the latest updates from the show! Be The Match offers the unique opportunity for you to give a life-saving marrow transplant to someone in need. Thousands of patients with leukemia and other life-threatening diseases depend on the Be The Match Registry, the largest and most diverse registry in the worlds, to find a life-saving donor. The more potential donors that step forward, more resources are available to patients and more lives can be saved. Be The Match will have a booth at DefCon 18 where individuals can register to be part of the Be The Match Registry. All they need to be is between the ages of 18 and 60, meet the health guidelines and be willing to donate to ANY patient in need. At the recruitment drive, you will fill out a consent form with contact information and a short medical evaluation. You will receive more information about what it means to be a donor and then you will swab the inside of your cheeks. Your tissue type will be listed in the Be The Match Registry until your 61st Birthday. If you are a match for someone in need, then you will be contacted for donation. This year we are offering 802.1x/WPA-encrypted wireless access for Internet access. In order to access the "DefCon-Secure" wireless network, you will need to create login information for yourself. We have setup a self-registration website. Go to this site to register a username & password. You can hit it from your phone, WWAN, or the open DefCon wireless. We have also included a copy of the SecureTrust CA root certificate in case your device does not have it in its default certificate trust chain (many systems do, some do not). 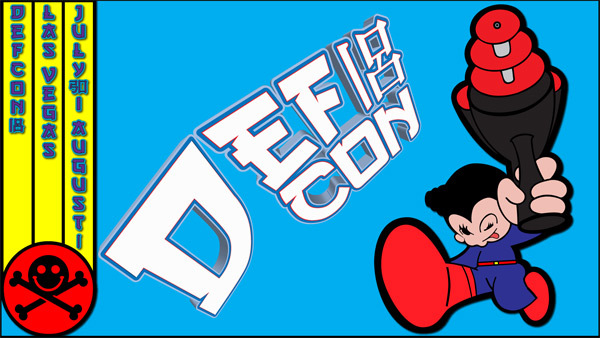 There's a ton happening leading up to DEF CON 18 in just twelve more days! The Mystery Challenge is heating up! Check out the Mystery Challenge forum for the latest hijinks! We have some bad news, unfortunately the Geo Challenge will not be happening this year. You can read more about this on the Geo Challenge forum. Our sympathy goes out to the organizers for what promised to be a great contest. Definitely look for it next year! Dark Tangent is busting out the Tamper Evident Contest, in which you debunk the phrase "Impossible to reseal or re-use", and document how you did it! The Backdoor Hiding Contest, in which you test your skills at hiding and finding backdoors. Capture the Packet is a cool new network scavenger hunt. Look for clues, solve puzzles and win prizes! Crack Me If You Can: 53,000 password hashes, 48 hours, nuff said! PCB PWNage is a mini contest from the Hardware Hacking Village to find out who can design the coolest PCB! The Twitter Hunt: Follow @TheSuggmeister and watch for the clues that lead to prizes! For all the latest info on contests and events at this year's DEF CON, check out the DEF CON Forums! 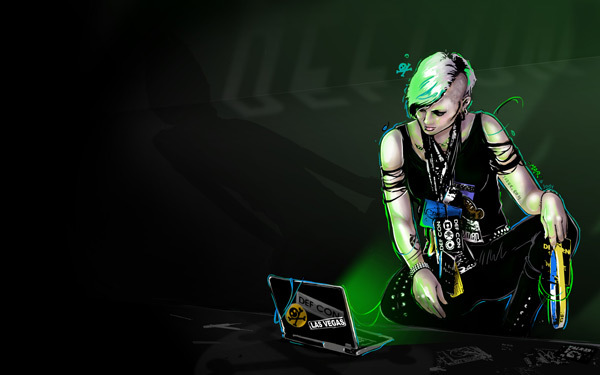 Congratulations to the Winners of the DEF CON 18 Artwork Contest! We had a bunch of great entries this year, But we could only pick a few! Second place goes to "DEF CON Boy" by oshu! Third Goes to "Her" by emtag! Congrats to all the winners and a big thanks to all who entered! To view and download all the wallpapers from this year's contest got to the DEF CON 18 Artwork Contest Public Gallery! You can now view all the bios and samples from the killer line-up of artists performing at DEF CON this year! Check them out on the Entertainment page. Do we need to say much more than that? Check out the DEF CON 18 Speaking Schedule. The DC18 Speaker List is Still Growing! Here's another twenty-four hot-n-fresh new DEF CON talks. Feast. Anthony Lineberry, Tim Wyatt, David Richardson, Sr. Here's a new list of speaker adds You're probably not even finished absorbing the last one. That's just how we do. Deal with it. FOE‚ The release of Feed Over Email, a Solution to Feed Controversial News to Censored Countries. Build Your Own Security Operations Center for Little or No Money. Build your own UAV 2.0 - Wireless Mayhem from the Heavens! We're working feverishly to get the talks finalized and posted - here's the most recent batch. Keep your eye on this space for piping hot update goodness. Evilgrade, "You Still Have Pending Upgrades?" Kartograph : Finding a Needle in a Haystack or How to Apply Reverse Engineering Techniques to Cheat at Video Games. Physical Security : You're Doing It Wrong! Kim Jong-il and Me: How to Build a Cyber Army to Defeat the U.S. Your ISP and the Government: Best Friends Forever. DEF CON 18 Contest Madness! Over the past week or two, we've had a flood of announcements for new contests! Check them out below! There are various tamper evident technologies out there, including tape, seals, locks, tags, and bags, to name a few. This contest will test your ability to perform "defeats" (Described below) against a range of inexpensive commercial low to medium security products. Two in one Backdoor Hiding/Finding Contest (participate in either or both): In the first stage, hiding participants provide a source code hiding a backdoor, in the second stage organizers mix the source codes with non-backdoored (placebos), and then ask finding participants to spot the placebos. Hiding participants get hiding points for being voted as a placebo and finding participants get points for spotting the placebos and negative points for false positives. As a part of an authorized penetration test of a large corporate network, you have captured a large number of passwords hashes. The hashes are from Active Directory, UNIX systems, LDAP servers, routers, etc. As part of your analysis, your client has asked for password complexity statistics, what their users are doing right and/or wrong related to generating passwords, and identification of weak passwords. You only have 48 hours to complete this effort. Congratulations to the qualifying teams for DEF CON Capture the Flag 2010! Official Quals info is live on ddtek.biz, so check it out for standings, correct and submitted answers by team and much more! Here's another great batch of talks for DEF CON 18! Stay tuned, we got tons of last minute submissions, so there's a bunch more more coming down the pipe in the next couple of weeks! Making the DEF CON 18 Badge. The folks at social-engineer.org have taken the reigns of the DEF CON 18 Social Engineering Contest, and Registration is Open! This promises to be an exciting addition to this year's DEF CON, and has some pretty cool prizes, including an iPad and a spot on the Social Engineer Podcast for 1st place. 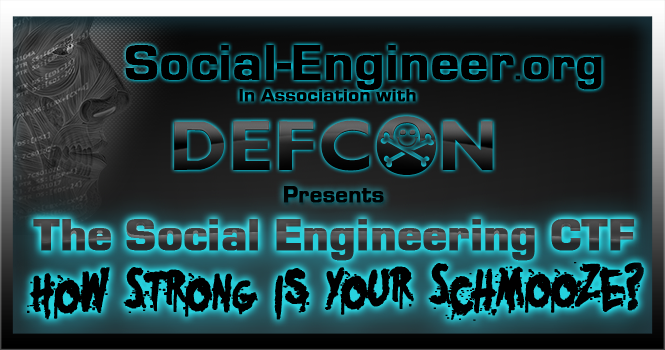 Check out the contest description and official rules at http://www.social-engineer.org/blog/defcon-social-engineering-contest/. Only a few more days to submit your CFP to speak at DEF CON 18! Call for Papers will officially close Tuesday June 1, so get those submissions in to share your cutting edge hacking research with the world! Check out the official announcement for details, and then fill out the Call for Papers Form. MiniBosses (http://www.minibosses.com/) have signed on as an official act to perform at theSummit on Thursday July 28th during DEF CON . They are the second act to confirm a performance spot at this years Fundraiser. At ShmooCon in February, DualCore announced that they will return again for this years event for the 4th consecutive year and 3rd year as the headlining act. Four mid-20's guys from Phoenix got togeather for one common cause...Recreate the NES hits you all know and love in real-time on stage for everyones enjoyment pleasure. They consider all Bossies to be their groupies from the costs of Toyko to the midlands of Michigan. If your into 8-bit power cords, get ready to ride the midi wave of Awesome! Blending the expertise of lawyers, policy analysts, activists, and technologists, EFF achieves significant victories on behalf of consumers and the general public. EFF fights for freedom primarily in the courts, bringing and defending lawsuits even when that means taking on the US government or large corporations. A transient, a local or a weekend Vegas Warrior, however you peg us, we are THE Las Vegas InfoSec group. Our members are long time DEF CON and Computer Security Industry avant guards. When we are not planning theSummit, we spend are free cycles conjuring up Social Engineering, Web and Windows attacks. We are always looking for new locals to Las Vegas OR frequent visitors to stop by our labs conveniently located in North Las Vegas for a beer and some InfoSec foo! The vortex is swirling folks. There's sense of urgency in the air, you can't quite put your finger on it, but it's beginning to make you a little nervous and a little excited. Can you feel it nagging the back of your mind? That little voice saying, ever so quietly, "Less than 2 weeks left to submit a talk! ", and "CTF Quals reg ends tomorrow!". Or maybe you hear, "write a short story", "Figure out LosT's puzzles" or "enter the Art Contest". That voice is actually us reminding you that all of these things are coming up or going on within the next two days to three weeks. So if you want to participate, you better get moving! Keep up on current events, as always, on the DEF CON Twitter, DEF CON Facebook, DEF CON RSS Feed and here on defcon.org! Here's another fresh batch of delicious Speaker goodness for you! Enjoy! DEF CON Security Jam III: Now in 3-D? Keep your eyes on the DEF CON 18 Speakers Page and the DEF CON Twitter for new speaker announcements! Here we go! Here is the first of many batches of DEF CON 18 talks to be posted! Expect more early in the week! Chema Alonso and José Palazón "Palako"
Cloud Computing, a weapon of mass destruction? "This is not the droid you're looking for..."
New DEF CON 18 Site! Check out the new site for DEF CON 18! It's got the most basic info for now, so keep your eyes peeled as all of the great talks, contests and events solidify! You can expect the first round of accepted speakers to be posted very soon! We're also working on a page to guide those new to DEF CON where to look for pertinent information. You will be able find all of the scheduling and entertainment info here as well as it becomes available, so be sure to follow us on the Twitter or Facebook feeds to stay up to the minute as we post new data! Wander around, get familiar, and be sure to check back for frequent updates to the madness that is DEF CON 18! New DEF CON 18 Short Story Contest! This contest is new this year and we are hoping it goes over well. Lots of you out there are avid writers and some just have an incredible imagination that when put to paper it blows your mind. Speaking from several years of reviewing white papers and slide decks, you guys are hilarious. We'd like to see your flair for creative writing put to another use and reward you for a (*cough*troll*Cough*) job well done. Good Luck! Check out all the details on the Short Story Contest Forum! Do your hear it? The whir of the gears of DEF CON planning reaching operating speed? All around us events are springing into action! HighWiz has stated intention to bring back DC101, a primer for those new to attending DEF CON. Not many details yet, but you can stay tuned to DC101 on the DEF CON Forums to stay up to date with details as they become available! We've also noticed that The Summit will be back this year, hosted by Vegas 2.0 to benefit the EFF! You can find details on the Summit Facebook page! We also can't fail to mention recent activity on LosT's Mystery Challenge. He says it's going to be the last year, so you better pay attention if you want to participate! You can follow the Mystery Challenge Forum and the Official Mystery Challenge Site at ten-five-seven.org. There is also a new forums based contest, called "What's in Neil's Pants", wherein Nikita asks a trivia question every week for the chance to win fabulous prizes from the things Neil leaves in his many pockets when he throws his pants in the hamper. You can also look for the DEF CON 18 Website to launch by the end of the month with an announcement for the DEF CON 18 Artwork Contest to be released in early May! As always, keep your eyes trained on the DEF CON Twitter for Updates as they occur! As the winter snows begin to melt, revealing a landscape full of promise and hope, a hacker’s thoughts turn to flights of fancy: specifically, the thought of being in Las Vegas during the last weekend in July. Contest and event planning is starting to heat up! A few more have surfaced (marked in white) and some others have begun conversation! Check out your favorite DEF CON Contest or Event link below for more info! Keep your eyes on the DEF CON Twitter, DEF CON Facebook, DEF CON RSS Feed and defcon.org for updates! Defense Diutinus Technologies Corp (ddtek) is pleased to announce the round of qualification for DEF CON 18 CTF. DC949, the creators of the Open CTF Contest (formerly Amateur CTF), after five long years have decided to step down as organizers. DEF CON would like to thank them for all of their hard work over the last five years in making a contest that was not only fun, but also open to all who'd like to test the waters of Capture the Flag type competition. They have passed the torch to a team that has competed in their contest many times, TubeWarriors. Welcome TubeWarriors, we wish you luck! You can read more in the Open CTF thread on the DEF CON Forums, as well as DC949's Farewell Thread. 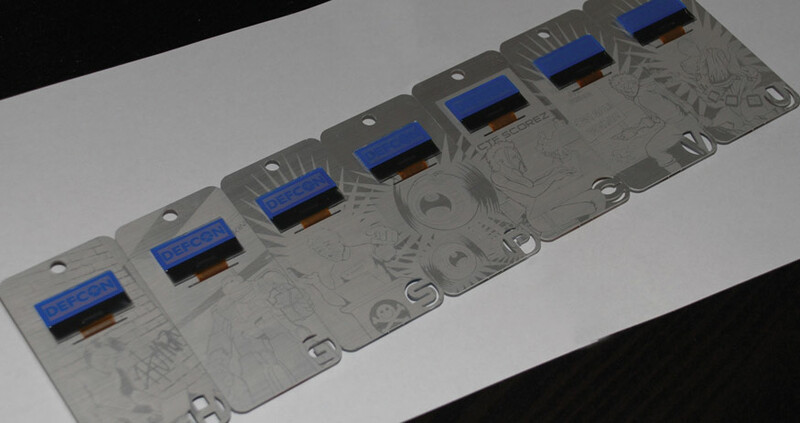 With the electronic DEFCON badge now in its fifth incarnation, we've decided to try something different. We're opening our kimono (just slightly) for DEFCON attendees, groups, villages, or contest organizers who want to integrate some piece of information or hide some piece of data in the badge to help further their cause during the con. For example, maybe your contest wants to hide a clue on the badge and then contestants have to find it in the code or press a certain button to reveal it... Read more on the DEF CON Forums. Submissions are due by April 1, 2010. As some of you may know, One of our speakers Thomas Wilhelm was recently a bone marrow donor from the Be the Match program. He contacted us about setting up a registry drive at Defcon 18. We like that Idea and are going to do what we can to make sure they have the space they need in order to grow their donor registry. You can Read More on the DEF CON Forums, and keep your eye on that forum for further details as they develop. Want To Be A DJ or Band At DEF CON 18? The Artist Bookings for DEF CON 18 Bands and DJs are currently open! If you are a DJ or a Band that would like to play at the Black and White Balls, by the Pool, in the Chill Out area, or various other DEF CON events, now is the time to submit your application! DJ Great Scott will be accepting submissions up until May 3rd, 11:59pm (23:59) CST (US CENTRAL). You can find his post announcing this on the DEF CON Forums and fill out the application form. Good Luck!